In our research on creative class consumers, we find that many creative class members have high expectations that their vendors adhere to their creative class ethos. From Spingwise, a short piece on Dole's attempt to provide more to their organic customers. "Dole Organic lets consumers “travel to the origin of each organic product”. 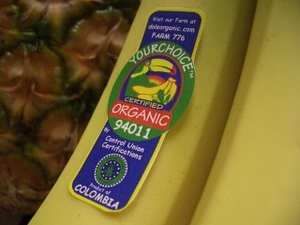 By typing in a fruit sticker's three-digit Farm Code on Dole Organic's website, customers can find the story behind their banana. Each farm's section on the website includes background info, shows photos of the crops and workers and tells consumers more about the origin of Dole's organic products." Here is a link to the farm (#776) that produced the banana in the picture. And just for fun, here is Kirk Cameron and a friend on YouTube using a banana to prove creation (though they forget that a banana fits in a chimp's hand as well as it fits into a human hand).